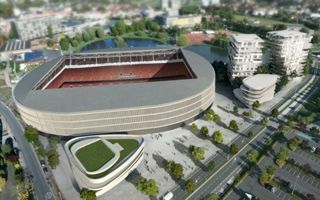 Ever since the redevelopment of Regenboogstadion began in 2014 it was always planned that additional buildings will be delivered in its direct vicinity. This way additional housing will be made available, a hotel and commercial spaces created, while the city of Waregem will get new quality of leisure in one of its most picturesque locations. Today we’ve learned how the planned additional functions should look. ION, Alheembouw and de Steenoven will most importantly deliver two 13-floor residential towers, each with unique asymmetric shape. Altogether there will be 112 flats, some of which will enjoy a view inside the stadium itself. Partly detached from the rest with their semi-private space, the two towers will stand close to one of two local ponds. Closer to the stadium and within fully public space a hotel with 60 rooms is planned. Another building with office, commercial and retail uses will also be built. On top of all these functions additional parking spaces have to be created. After all, all four new buildings are planned on what used to be a public parking site. Three-level parking site will accommodate 300 cars, available to fans on matchdays and for Waregem’s ring-road users on daily basis.